Log End Seal protects exposed log ends from deterioration due to the elements. Sunlight, wind, rain, snow and ice all play a role in degrading wood surfaces. This is especially true for log ends where the end grain is exposed and cracks and checks are prone to develop. Even if the ends are coated with a quality stain, the exposed grain of the wood acts like small straws drawing water into the log. This gives rot and decay an opportunity to start. If left unprotected, log or log corner replacement may eventually be required. Log End Seal is a clear finish that helps to keep water from penetrating into the log ends and provides a durable layer of protection against sun, wind, and weather damage. To get the best appearance and color match, grind and sand log ends smooth, then apply Lifeline exterior finish. 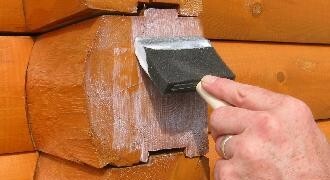 When dry, apply a coat of Log End Seal to form a water repellent barrier. Finally apply a clear topcoat of Lifeline Advance Gloss or Satin.